The study by Galinsky and Huang in Scientific America (1/4/11) showed that just by standing up and sitting straighter you could increase your testosterone levels and decrease your cortisol levels. These hormones play vital roles in our health. Testosterone has many benefits including increased energy, better sleep, increasing muscle mass, improved weight loss as well as a host of others. Cortisol, on the other hand, is more of a stress hormone. Cortisol is referred to as the stress hormone because it can increase inflammation, weight gain, and other negative side effects. Being out of alignment, poor posture can lead to pain in your body as well. Chiropractic care can help improve your posture by realigning the vertebrae in your spine. When these joints get out of alignment they can put pressure on the surrounding structures. This includes the joint, disc, nerves, muscles, ligaments, and tendons. When out of alignment it makes it much harder on the body to be able to function properly and hold you upright. Chiropractic adjustments focus on specific areas to help get your spine in the proper position. Social psychologist and Associate Professor at Harvard Business School, Amy Cuddy, shared some of the research findings behind posture and hormonal changes in a TED talk in June 2012. From a social standpoint, we know that how we present ourselves effects how others perceive us, but it can also effect how we see ourselves. Her research demonstrates that even if we do not feel confident, when we alter our posture, by placing ourselves in a “power pose,” our hormones begin to shift within us. Changes in posture resulted in hormonal changes among the participants. 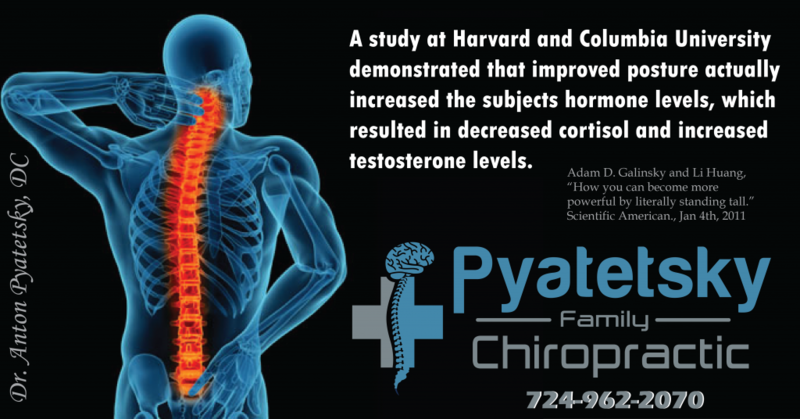 The participants with a “power posture” experienced about a 20-percent increase in testosterone, while those that took on a “defeated posture” had about a 10-percent decrease in testosterone after maintaining their posture for two minutes. The stress hormone cortisol also demonstrated changes when the posture was altered to “power” and “defeated” positions. The “power posture” people experienced about a 25-percent decrease in cortisol production, while the “defeated posture” participants experienced a 15-percent increase in cortisol. Cortisol is released in times of stress, injury, and poor posture situations. Increased cortisol will lead to weight gain, hormonal imbalance, fatigue, poor sleep, impaired healing, and a wide variety of other symptoms. Improving our posture is more than creating a good outward appearance for other people. Great posture is a sign of health, and can affect quality of life and our life span. In addition to chiropractic care is used in our office in order to help patients improve their posture. Take control of your posture today, and change your health. Chiropractic care can start you on the process for restoring hormonal balance, increasing self confidence, decreasing aches and pains, and living longer.